It's a delight to welcome Elizabeth Johns, who is about to duck into the ring with Gentleman John Jackson! 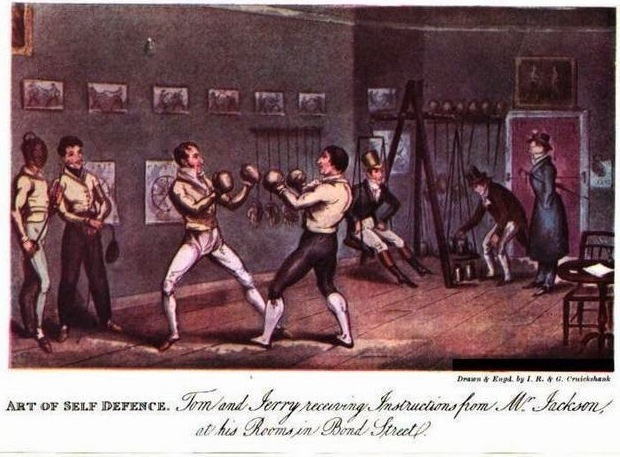 Gentleman John Jackson and his Boxing Saloon—a name and place canonized on the pages of many a Regency tale, and the chosen pastime for many a London gentleman who would not dare sully their hands with work. How does a pugilist, born to a family of builders, come to bear the name Gentleman Jackson? A bare-knuckle fighter who only fought three times publicly, he only won twice. He managed to take down the reigning champion, Daniel Mendoza, in ten and a half minutes with nary a scratch, to become the champion of England in 1795. Not shabby for three showings. Moreover, how did a pugilist, who made his living in fighting, manage to enthral the elite of London society? Celebrity. Yes, even the Georgians were susceptible. Combined with unscrupulous manners, elegant dress, and a proper drawl, Jackson found yet another winning combination. 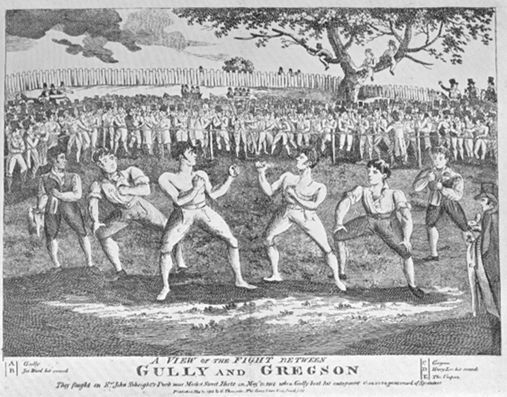 Jackson created rules for the sport, which required using fists alone, rather than the whole-body scrapping, hair holding, and kicking the sport had oft seen in practice. Despite the fact that he instituted some steps towards civilized sport, the matches lasted up to fifty rounds—each round lasting until one fighter was knocked off his feet. It was much later that gloves and shorter, timed rounds were instituted. Although practising pugilism for sport was well-accepted, holding prize fights and the rowdy crowds and heavy betting that accompanied them was not looked upon favourably by the magistrates. Fights were held far from London, with as many as 20,000 spectators, while bets have been recorded as high as 50,000 pounds. There is little explanation for why human nature enjoys watching flesh pound flesh. However, John Jackson was a self-made gentleman who capitalised on that very thing. Written content of this post copyright © Elizabeth Johns, 2016.
thought we'd get a little more info, perhaps who some of his famous gentleman clients were. Interestingly, Jackson's famous win over Mendoza [IIRC 1795, or 6] was won by using the expedient of hair-holding. Mendoza was vain about his long, wavy hair, Jackson shaved his head, which was usually a sign of a pugilist who was inclined to use hair-holding. 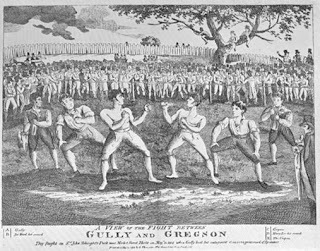 Mendoza only had real trouble with two other pugilists, Jackson, and Humphries, who beat him very decisively in January 1788. [Yes, I've been researching; the WIP is about a gentleman who disguises himself as a pugilist to recoup the family fortunes through the side betting.] Many people called shame on Jackson for using hair-holding, but it was legal then, and in fact that fight was responsible for having it banned. 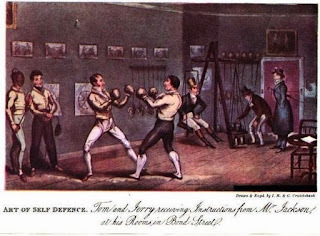 Mendoza also had a school of boxing, which he opened in the latter part of 1787. Indeed. The most famous I read of was Lord Byron, and it was reported on some blogs the two had a relationship. I was unable to verify credible sources of any other illustrious clientele. Even more interesting how he gained his nickname, then! I had not come across that tidbit. Thank you for sharing! I've seen the claim about Jackson and Byron having a fling - one place said Byron claimed so in his journal. Byron's journals are on Project Gutenberg. Unless a) it was expurgated (possible) or b) he referred to G Jackson as something other than John or Jackson, this is not true. I was disappointed, actually, that I couldn't find that breath of scandal. What I am looking for tonight are primary sources for Gentleman John Jackson, and not finding a lot. I've found that he adopted his niece (states so on his tombstone), his brother Mason carved wood for printing illustrations - but the claim didn't have a reference - and this page states he's from a family of builders, again not citing a source. Anyone know of primary sources I can look at? I shall see what I can find, though nothing springs immediately to mind! My understanding is the nickname came because he was a peacock, in regards to his manner of dress. I particularly remember reading about a red overcoat with gold buttons. 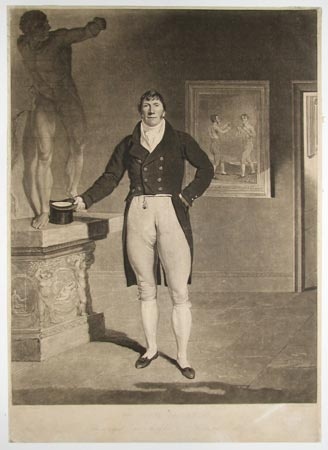 He was also able to write and seemed to serve as a man of business for Byron.